Because Crete is an island it lacks certain animals found on the mainland, particular large predators: there are no wolves, foxes or bears nor are there any boars or deers. In the Pleistocene there were several species of deers, dwarf elephants (Elephas creticus), a pig-sized hippopotamus (Hippopotamus creutzburgi), giant rodents but no large carnivores. 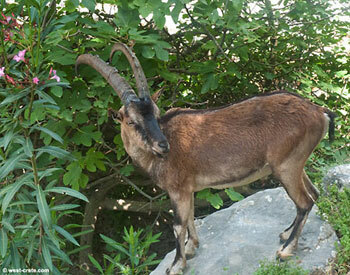 The largest and best known mammal of Crete is without doubt the Cretan wild goat (Capra aegagrus creticus), also known as agrimi or kri-kri. Larger than a domestic goat the male grows huge curved horns. Once common all over Crete it became threatened with extinction once people started hunting wth rifles. Trying to prevent its extinction led to the creation of the Samaria National Park. The Cretan wild goats are now seemingly doing quite well even though their population is only limited to several gorges (Agia Irini, Figou,Tripiti, Klados, Samaria and Eligas) and the mountains nearby. Populations of Cretan wild goats were also moved to the islets of Dia (north of Heraklion) and Theodorou (a small island to the West of Chania) in order to protect them from poachers. As it is not at all their natural environment they are not really thriving there. Recent DNA studies have shown that the Cretan wild goat is in effect a Neolithic ancestor of the domestic goat that has returned to the wild. Other native mammals (as demonstrated from Pleistocene finds) include badger, marten, the fat dormouse (Glis glis, also called edible dormouse) and the Cretan spiny mouse. Animals without a fossil record include the hedgehog and the brown hare. There is also a Cretan wild cat which only lives in a few remote gorges, is almost never seen (but shepherds sometimes hear them at night) and is close to extinction. Other mammals include several species of bats, mice and rats as well as a few rabbits on some offshore islets (such as Dia and Theodorou). Since their introduction in the Early Neolithic sheep and goats have been the main livestock animals. There are now over one million goats and sheep in Crete (1990 figures) creating quite a severe overgrazing problem in many areas. It seems that many European visitors find it difficult to differentiate goats and sheep, possibly because the sheep they are used to seeing in northern Europe are shorter legged and more woolly. Take a closer look at the pictures on the left...they really are very diffrent animals! Oxen and cows used to be common in Crete with the average household owning a pair in order to pull the plough but now they have almost completely disappeared, replaced by tractors as they are not well suited to grazing on the sparse Cretan vegetation. The same could be said of the horses (never well adapted to the stony Cretan terrain), donkeys and mules who were replaced by pickups. Pigs remain a common domestic animal fed on kitchen scraps. There are plenty of dogs but there are almost no sheep dogs. As sheep have no predators there is no need for dogs to protect them. Cats (which appeared first in Europe on the Knossos frescoes) are also well in evidence everywhere. The Mediterranean Monk seal (Monachus monachus) is very occasionally seen on the shores of Crete. At some 350-450 (around half of those in the Aegean Sea) remaining individuals it is one of the most endangered mammals in the world. It reaches a length of up to 2.70m and a weight of 320kg. Dolphins (Delphinus delphis and Turslops truncatus) and porpoises (Phocaena phocaena) are plentiful but they are rarely seen close to the shore. There are also some whales but sightings are not common. Because birds can fly there are no great variations with surrounding countries. Crete is on the migratory path between Europe and Africa so gets a great number of birds passing through and using Crete as a resting place on their migration. There are also many species that are present throughout the year. 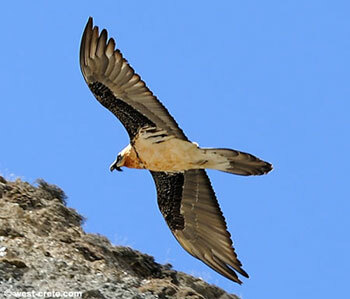 Of particular interest is the still comparatively large number of raptors such as Griffin vultures (Gyps fulvus), Bearded vultures or Lammergeier (Gypaetus barbatus), Golden eagle (Aquila chrissaetos), Bonelli's eagle (Hieraetus fasciatus) as well as many types of smaller raptors such as buzzards, kites and falcons. There are four kinds of snakes in Crete (Balkan Whip Snake, Leopard Snake, Dice Snake and Cat Snake) but none of them are dangerous to humans. Other reptiles include the Moorish and Turkish geckos, Ocellated Skink, Erhard's Wall Lizard and the Balkan Green Lizard. The most famous reptile is of course the Loggerhead Turtle (Caretta caretta) which is the only species of Mediterranean sea-turtles that nests in Crete and Greece..
Crete is a big producer of honey so there are plenty of bees around. In the autumn there are also quite a few wasps. Hornets can be found near springs and water places. None of these will sting you unless they are threatened. There are also mosquitoes in summer but it will depend entirely on where you are. Some areas are quite free of them, other places have a lot...and it varies from year to year so impossible to warn you. There are also scorpions in Crete so be careful when lifting stones and especially rumaging in old wood piles. But the sting of a Cretan scorpion is not dangerous to humans, just painful. You might find the occasional jellyfish in the sea in the summer months. It's not common but it happens. There are plenty of sharks in the Mediterranean (and around Crete) but there is no record of anyone ever being attacked by one in Crete so this is very safe.